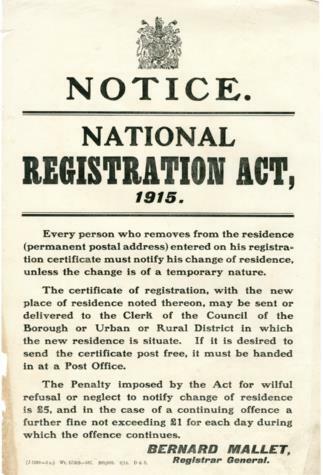 National Registration Act 1915. Every person who removes from the permanent postal address entered on his registration certificate must notify his change of residence unless the change is of a temporary nature. The Certificate of Registration, with the new place of residence noted thereon, may be sent or delivered to the Clerk of the Council of the Borough or Urban or Rural District in which the new residence is situate. If it is desired to send the certificate post free, it must be handed in at a Post Office. The Penalty imposed by the Act for wilful refusal or neglect to notify change of residence is £5, and in the case of a continuing offence a further fine not exceeding £1 for each day during which the offence continues. Bernard Mallet, Registrar General.